eeni meeni miini moh (for 0-5 years) and e3-M (for 2-12 years) have reduced all Spring Summer 15 stock including the very popular hypercolour tshirt and dress. Starting on Boxing Day, 26th December 2015 and will be live until 3rd January 2016. With up to 25% off our entire current season range and up to 60% off previous season's stock, you really won't want to miss it! Four in the Bed children's pyjamas will be going on sale on Boxing Day with 50% plus across the website. 20% OFF storewide on all moccasins through to New Years Eve! 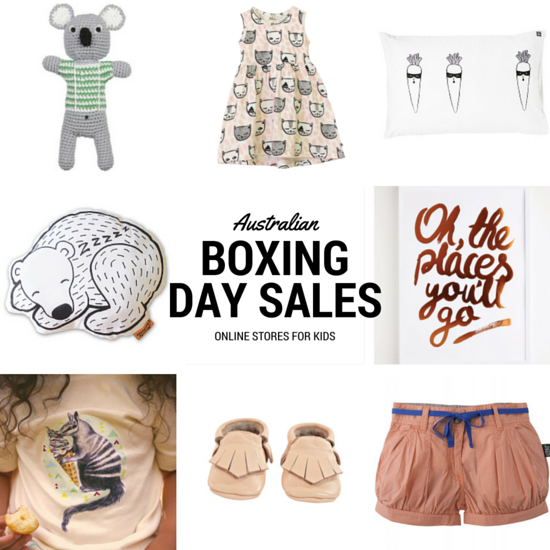 Boxing Day sale on a huge range of children's clothing and products. 30% off storewide from 1-3 Jan 2016. Code is NEWYEAR. Up to 30% off selected styles. Up to 40% off selected items using the code BOXING15. (sale includes 15% off Armadillo & Co. rugs). Sales on felt ball rugs and interiors decor. Hello Little One is running a 48hour Boxing Day sale. 25%off store wide. Use the code Boxing25 at checkout. Sale for a limited time only on selected products only. This sale is end of line products and not to be repeated items. It is our biggest sale to date so don't miss out! Boxing Day sale on wall decals and more until midnight 28th December. 40% off everything online until midnight 27th December with code BOXXED. Up to 70% off products until 29th December. Up to 60% off until 31st December, while stocks last. 25% off storewide online until 28th December. 40% - 65% off everything; prices as marked until sold out. Ends 10th January 2016. 25% off storewide on prints and canvases until 1st January with the code christmas25. 25% off full price - use code BOXINGDAY. Up to 70% off sale items. Prices as marked. 15% off all art prints from 27th - 30th December. Enter code: BOXING at checkout. We have very limited stock available, so be quick! Lots on offer from $5, and three tea gift cubes for the price of two (of equal value) in-store until 4th January 2016. Take 20% OFF the Marked Price of all Naomi Murrell and Darner goods. Use the code: BOXINGDAYSALE at the checkout to receive your discount for online orders. For a limited time only. Sale ends Midnight 28th December 2015. Aura's biggest ever sale with up to 80% off. Up to 50% off selected styles. Limited time only. 20-60% off everything until midnight 28th December. 20% off selected products until midnight 26th December. 20% off all screen printing, weaving and shibori workshops until midnight 28th December with code BOXINGDAY20. Up to 70% off selected items until 26th December only. Looking for more? Check the stores in the Bondville online shopping directory to check for sales and specials. Happy shopping!